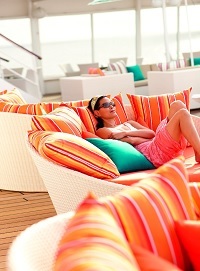 There's so much to do on a Crystal cruise. Complimentary evening of specialty restaurant dining at least once in Silk Road or the Sushi Bar celebrating the cuisine of Nobu Matsuhisa, and at least once in Prego. Additional reservations or walk-in visits available for a modest fee. Vegas-Style Gaming - The Crystal Casino elevates the excitement each evening with Texas Hold 'em, blackjack, mini-baccarat, three-card poker and craps tables and nearly 100 slot machines. High-Energy Nightlife - From favorite disco hits to current chart-toppers, state-of-the-art sound and lighting systems add a contemporary vibe to our late night dance clubs. Spectacular Entertainment - Uniting West End and Broadway, Hollywood and Vegas. In virtually every industry poll, Crystal's rich variety of entertainment offerings ranks number one. Love To Dance - The tango, the rumba, the foxtrot and more. Dance to your heart's content with live music in our lounges and nightclubs. On every voyage, Ambassador Hosts are pleased to dance with our single female guests. Intimate Places - Enjoy romantic moments at the Avenue Saloon piano bar, or sneak away for a leisurely stroll along the Promenade under a symphony of stars. Travel to Taste the World - Classic yet inventive, simple yet sophisticated... 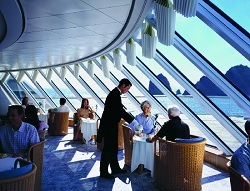 Crystal Cruises is renowned for our award-winning cuisine. Aboard both ships, the elegant Crystal Dining Room sets the stage for exceptional culinary experiences during breakfast and lunch, further enhanced with a progressive new Modern menu alongside a Classic menu and traditional favorites for dinner. 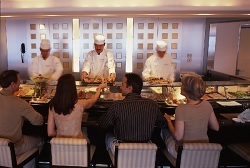 European-Trained Staff - Creativity, innovation and gracious service are the hallmarks of Crystal's culinary philosophy. Our European-trained staff is immediately familiar with your every preference, whether sparkling or still water, or the exact preparation of a fillet steak. Perfect Choice Dining - With our signature focus on choice, Perfect Choice Dining invites you to write your own personal definition of luxury in the Crystal Dining Room. Three distinct dinner options include Classic Main, Classic Late, and Dining by Reservation. Breakfast and lunch are open seating. Classic Main or Late - The camaraderie of a shared table each evening with the same dining companions and wait staff continues to be the preference of many guests who have the choice of Classic Main (6:15pm) or Classic Late (8:30pm) in the Crystal Dining Room. Dining By Reservation - This unique concept invites you to reserve a table in the Crystal Dining Room at a different time each night of your voyage if you wish. An ideal option for those seeking a little more flexibility in their evening schedule. Modern Cuisine - Incorporating the doctrines of molecular gastronomy, expanded local sourcing, new high-tech culinary equipment, and the creativity of our highly-trained chefs, our Crystal Dining Room's Modern Cuisine menu boasts more than 100 new dishes of epicurean excellence that are artistic, and also surprisingly healthy. Elevating the Experience - Each evening in the Crystal Dining Room, guests may choose from two dinner menus presented side-by-side: the new "Modern" menu includes dishes such as a slow-cooked Shiraz-braised oxtail ragout or a re-imagined Strawberries Romanoff with Cotton Candy dome, while our "Classic" menu offers traditional favorites. Classic Cuisine - The Crystal Dining Room is renowned for its inventive menus showcasing the flavors of the world together with time-honored classics such as a Grilled Black Angus Fillet Steak with Peppercorn Hollandaise, Escabeche of Prawns with Braised Saffron Fennel, our Chef's Favorite Wiener Schnitzel, a savory Bouillabaisse, Fresh Dover Sole "Meuniere," and decadent Alaskan King Crab Legs. Decadent Desserts - From Paris to Vienna, New York to Las Vegas, Crystal's pastry chefs travel the world in search of the very best desserts. With names like Champs-Elysees and Villa d'Este, our pastry menus combine unexpected flavors to create mouth-watering mini works of art. A Passion For Perfection - Tables dressed in Garnier-Thiebaut linens, carefully set with Riedel crystal, Villeroy & Bosch china, and modern Korin glassware. Subtle touches of elegance for inspired, critically acclaimed cuisine. Privileged Perspectives - Exquisite views of an ever-changing horizon. From the sublime comfort and quiet privacy of your well-appointed verandah stateroom or suite, watch the world unfold before your very eyes. Be Pampered - A haven of serenity. Your Penthouse is attended to by a personal butler, anticipating your every need. Complimentary amenities also include wine and a selection of your favorite spirits. The Difference is a Perfect Night's Sleep - Your complete comfort is our only wish. After a day of discovery and enrichment, lay your head on a pillow to dream of tomorrow's new adventures. Sanctuary At Sea - Your spacious, contemporary stateroom has all the touches of home... wireless Internet access, remote color television and DVD player, soft drinks and bottled water. And something not found at home - an amazing ocean view. This is your sanctuary. The Finer Things - The softest linens and Egyptian cotton bath towels. Comfortable kimonos and plush Frette robes. Personal slippers and indulgent bath amenities. Only the finest luxuries are found throughout your thoughtfully appointed stateroom. The Ultimate Indulgence - Step across the threshold of a Crystal Penthouse and enter a world of rarefied luxury. Separate living and dining areas, a private workout studio, Bang & Olufsen sound system, three flat-screen televisions, a sumptuous master bath with ocean view. Delicious Beginnings - As morning breaks on shore, savor the arrival of each new day with a quiet breakfast on your private verandah. Or, enjoy complimentary in-room dining any time, day or night. The choices, all of them, are exclusively yours. Simple Luxuries - The pure beauty of fresh flowers. The pampered comfort of twice-daily housekeeping and nightly turndown service. The difference is Crystal clear. Cruising is all about lifestyle: fine wining and dining, visiting exotic destinations and enjoying extravagant production shows. 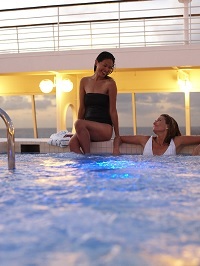 But today's guest is also interested in balancing the rich life of a cruise with health and fitness. 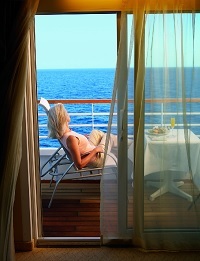 If that sounds like you, then Crystal Cruises is your perfect vacation. 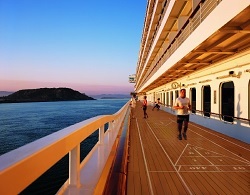 From the wrap-around, all-outdoor teak Promenade Deck - one of the most popular features on all our ships, and one you won't find on many other large cruise ships - to a Spa with one of the world's best views, every Crystal cruise offers a variety of options for keeping fit and well. Our popular Computer University@Sea program is offered on all cruises. CU@Sea provides e-mail services, Internet access, group and individual instruction on use of a PC, extensive enrichment course offerings and digital camera support. Each ship has at least 25 state-of-the-art workstations. 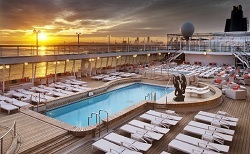 Complimentary classes are offered each cruise. Details of these are listed in the onboard daily newsletter Reflections. There is a nominal setup fee when you begin to use any CU@Sea services involving off-ship communication. Fees apply for e-mail sent and received on board, as well as Internet access. Did you ever dream of playing the piano? Could your palate improve with coaching from the Society of Wine Educators? Is there a great designer hiding inside you? The Crystal Cruises Creative Learning Institute brings out the best in you by bringing you the best instruction available at sea. The Institute expands upon Crystal's commitment to enrich mind, body and spirit by extending new opportunities for personal growth. We offer expert instruction from our partners who include: Yamaha, Berlitz, Tai Chi Cultural Center, The Cleveland Clinic and The Society of Wine Educators. On every sailing, Crystal Cruises offers a host program that includes carefully screened gentlemen with interests and backgrounds similar to those of our guests. Each distinguished Ambassador Host is cultured, well traveled and an accomplished ballroom dancer.